Head coach Daryl Powell is pleased with the way his team has learned to handle difficult conditions. The Tigers struggled in the wet weather at last year’s Grand Final, but have had plenty of practice to improve their game in tough conditions this year and with the exception of the Warrington “splashdown” match they have come out on top on each occasion, including last week’s game against Wakefield Trinity. 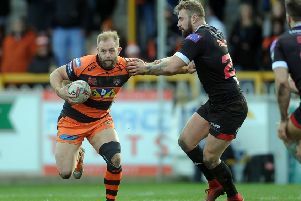 “We saw the conditions through the day and we knew it was going to be difficult for both teams,” said Cas boss Powell. “We’ve had two games with Wakefield now and both were played in pretty wet conditions. “I thought we handled the conditions quite well. We kicked exceptionally well in attacking positions and put a lot of pressure on Wakefield. Understandably in the conditions last Friday’s game became a bit of a forwards battle with the Tigers pack coming out on top and Powell was pleased with his big men. He added: “I was really pleased with Gadwin Springer and the returning players in the pack. Jesse Sene-Lefao was full of energy and it was good to have Junior Moors back out there with Paul McShane in the middle of it all.